Are you looking for a “warm-up” or a “Daily Routine?” Here are some handouts I give to my students. Feel free to use them yourself. If you are a music teacher feel free to copy these and give them to your students. Please enjoy my collection of fundamental exercises for tuba, trombone and euphonium. Besides the beginning low brass warm-ups, I also have transposed the daily routine for trumpet and horn ("French horn"). I use these materials in music lessons all of the time. 9) See below: Advice regarding audition preparation. In October of 2009 I had the pleasure giving a lecture following Grammy Award Winning Composer and world-class trumpeter Anthony DiLorenzo at Puget Sound’s annual BRASSworks event. My topic was audition preparation and the notes I used to give that lecture are printed below. For a printable version of this lecture, please scroll down to the end. There are many different types of auditions. There are many similarities between these different types of auditions and some notable differences. The nervous energy felt by a middle school band student auditioning for “first chair” could be very similar to the feelings a young professional might feel at her/his first professional audition. Some auditions are live, some are recorded. Some auditions are behind a “screen” or a curtain, some are not. I believe the key to any audition is intelligent, effective preparation. One very important component of preparation is getting adequate time in the practice room. However, time in the practice room alone is no guarantee of success. One has to become a master of effective and efficient practice. Efficient/effective practice room habits could be another lecture unto itself, but permit me to spend a brief moment on the topic. Study privately—there is no substitute for a high quality music teacher. Lessons are essential. Spend a healthy amount of time each day listening to music; both masters of your instrument and other great musicians as well. Have a solid, consistent fundamental approach to your instrument. Do not skimp on fundamentals to create more “practice time.” I strongly think that both in the short term and in the long run “fundamentals” are paramount to success. When you start a practice session, have clear goals in mind. What did your private teacher talk to you about? What were you going to try to emulate from listening to recording? Where will your time best be spent? We have all spent hours playing our favorite movie music or band/ orchestra music but, especially where audition preparation is concerned, a practice session has to be more than just fun time with your instrument. If you repeatedly play a passage incorrectly you are not practicing, you are “anti-practicing.” Repetition cements habits, good ones or bad ones, and this is certainly true in the practice room too. Find ways to learn difficult passages that are thoughtful and productive. If one student practices two hours a day and gets “X” done per hour and another practices for three hours a day and gets “1/2X” accomplished per hour, who is more productive? Take great care to develop good habits when learning music. There are many tools to help in your pursuit of excellence. A good metronome and tuner are essential; so are effective practice strategies (playing music down an octave, slowing passages down, using “un-even” rhythms to learn the most difficult passages etc.). Another potential similarity between different types of auditions is developing effective strategies for dealing with nervous energy. Many musicians practice their music a lot. Many do a great job of preparing in the practice room. However, many musicians also neglect to “practice performing.” This is important for any performance, including an audition. If the first time you perform your music for someone else is at your audition, you are doing yourself a great disservice. Good preparation in the practice room coupled with “practicing performing” will go a long way toward raising your comfort level at an audition. You may want to do something cardiovascular (e.g. run up and down the stairs or do a lap around the living room) before practicing performing—this will simulate the elevated heart rate and dry mouth which sometimes accompanies anxiety at an audition. If you are going to wear a suit to your audition, then practicing performing in one! If your tie is too tight, you can’t breathe in your skirt etc. you should want to know ahead of time! All auditions have the potential to require flexibility; this necessitates sufficient mastery of one’s instrument so you can make changes quickly. For instance, a Youth Symphony audition might come down to two seemingly evenly matched players. One might play tuba with great finesse and the other might have a great tone and orchestral concept. The music director may like both candidates and may ask each to play something again but to play it more the other tubist would have. 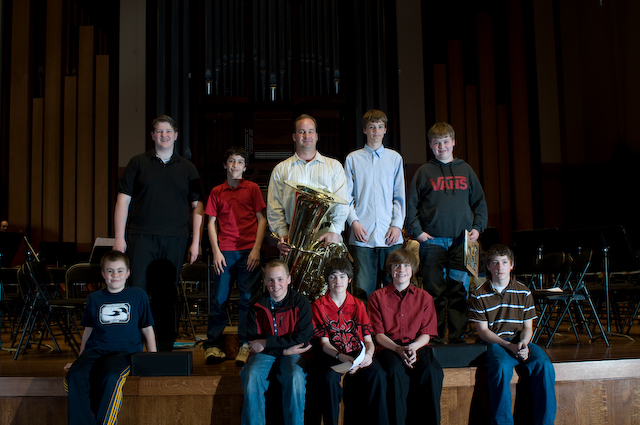 If one tubist can do this, and the other cannot, who do you think will be in the Youth Symphony? On the professional front, candidates must realize that they are not only competing against the other candidates but that they are also being held up to the musical standards of each committee member and the standards of the conductors as well; professional auditions do not always yield a job offer or a “winner.” The ability to make adjustments on a moments notice is paramount to succeeding at auditions; I have been through this as a candidate and as a committee member and cannot emphasize this enough. Professional auditions, honors ensemble auditions and the like are often fairly straight forward: learn the required music and be prepared to play it. Beware of the audition when you have to make those decisions! There are a lot of reasons not to show up to an audition and say, “Well, I have all of this music in my band folder, what should I play for you?” At an audition, you can never completely control what you will be asked to play but you should always have some music prepared, even if you and/or your teacher pick it yourselves. For many students, contrasting solo movements with a band or orchestral excerpt or two and a solid mastery of some scales will go a long way at most auditions. Think about a college admission scholarship audition. Imagine the two most extreme outcomes on the scholarship front: no award or a full scholarship. This could literally mean the difference in over $100,000 tuition dollars at many institutions over four years. It always pays to be prepared. Recorded auditions: I am of the opinion that one must make a technically flawless recording for a recorded audition at any level. A committee does not know the difference between a great talent who made a recording in less than ten minutes and a less talented individual who took days to make a recording and ended up with a better recording—they only know which tape sounds better. At many auditions, the folks screening the recordings won’t be very forgiving of a wrong note or a “loose rhythm.” If you take the time to make a great recording you will greatly increase your chances of accomplishing your goals. Backward planning: It is easy in September to know that you have an audition in February and to think that you have “tons of time” to prepare. I would like to spend some time discussing the false security of “all of the time you have” and effective ways to prepare in a thoughtful manner. These are a few similarities between different types of auditions and how to effectively prepare for them. Washington All-State and All Northwest Honor Ensembles auditions: You generally have to make a recording of three or so short etudes and perform a chromatic scale through several octaves. These recordings are usually due in October. Applicants who are accepted will be placed in an ensemble with further live audition for chair placement being a distinct possibility; often there is little advance warning of what you will be asked to play for the live auditions (see “Beware of the audition when you have to make those decisions!” from above). College Admission/Scholarship Auditions: You are not just auditioning to “get in.” You are also, at most institutions, also competing for a music scholarship. Some institutions have very specific audition requirements and others give very few guidelines. In any event, you will want to be well prepared for this audition. “Dress up” and give a good impression, both with your audition and with how you handle yourself. “Non-special” U.S. Military Bands outside of the United States Air Force: After meeting the requirements for enlisting in the United States Military, in most branches you have to pass an audition and be offered “a slot” in their band program. Upon completion of your Service’s respective basic Training, you will be assigned to a “Non-special” band. This is an audition where you will want to give them exactly what they are asking for and to also look the part. Special U.S. Military Bands and USAF bands: Openings are advertised on a case by case basis and, at least for the “Special Bands,” are for a specific position in a specific band. Candidates may be screened by resume and a recording before being invited to a live audition. You may be asked to stop playing at the live audition if the committee feels they have heard enough to disqualify you. Professional Orchestras: Openings are advertised on a case by case. Candidates may be screened by resume and a recording before being invited to a live audition. Live auditions usually happen in phase with the first being behind a screen (“blind”) and referred to as the “prelims” (preliminary audition). Eventually semi-finalist and/or finalist are selected and the screen comes down. You may be asked to stop playing at the live audition if the committee feels they have heard enough to disqualify you; I have heard trombonists griping about only getting through part of an excerpt before the ominous “Thank you” comes from the other side of the curtain. Recommend reading: Audition Success by Don Greene, Ph. D.
Thank you for being such a great audience. I will post a copy of my notes on RyanSchultzMusic.com on my education page.